I wrote the rave review you see below without realizing that I had reversed my headshell leads for the previous record I was playing and had forgotten to change them back. So all the nice things I said about Capitol really aren’t true: they got the phase backwards, which positively ruins the sound unless you can correct for it. I did, and was astonished at how musical the album sounded. Do you want an AMAZING example of how phase can affect the sound of a recording? Switch back and forth on Honey Don’t, especially if you are the skeptical type like me. You will become a believer on the spot, all doubt forever banished. I wonder how many other bad Beatle albums are phase reversed? We will report our findings as time goes on so watch for them. This is a Minty Capitol Purple Label LP with THE BEST SOUND I have ever heard for a Capitol Beatles LP. If more of them sounded like this we wouldn’t have said all those mean and nasty things about Capitol Records for the past forty years. Yes, they still “butchered” For Sale to create this “album”, but that’s not the point. The point is this record sounds like a good Parlophone pressing — rich and sweet, with dead-on tonality. Whatever tapes Capitol may have used had plenty of that famous Beatles Analog Magic in them — you won’t hear any Beatles CDs sound like this, that I can assure you. That sound is gone and it ain’t comin’ back. The late Capitol mastering here is Right On The Money. I don’t think they ever cut a record better. You can be sure the original Rainbow Label pressings sound as bad as you remember. I have never heard ANY original Capitol pressing that sounded like this — not even close. The two singles mentioned below both have DREADFUL SOUND, the kind we have come to expect from Capitol. Everything else is wonderful. Posted in Advice – What to Listen For - Polarity, Genre - Rock - Pure Pop, Labels We Love - Capitol, Top Artists - The Beatles (Individually and Collectively), Top Engineers - Geoff Emerick, Top Engineers - Norman Smith and tagged audiophile vinyl, Better Records, Hot Stampers, tom port on June 2, 2018 by humorem. 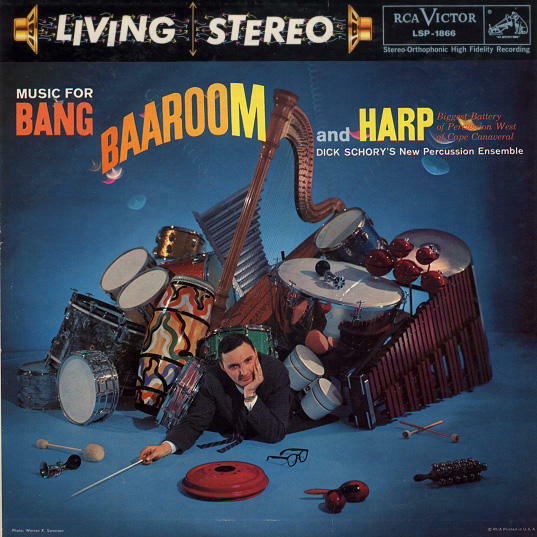 Music for Bang Baaroom and Harp is yet another one of the many pressings we’ve discovered with reversed polarity on some copies. Are audiophile reviewers or audiophiles in general listening critically to records like this? I wonder; I could not find word one about any polarity issues with this title, and yet we’ve played four or five copies with reversed polarity on side two. How come nobody is hearing it, apart from us? We leave you, dear reader, to answer that question for yourself. Harry Pearson put this record on his TAS List of Super Discs, and rightfully so. It certainly can be a Super Disc, but only when you have the right pressing. It’s a real treat to hear such a crazy assortment of percussion instruments with this kind of amazingly clear, high-resolution sound! This is one of the Demo Discs on the TAS List which truly deserves its status when, and only when, you have the right copy (read: Hot Stamper). Posted in *Our Record Overview - The Good, Advice - Playback, Advice – What to Listen For - Polarity, Masterpieces of Rock and Jazz, TAS Super Disc List and tagged TAS Super Disc List on March 14, 2018 by humorem. To that end we have created exercises, experiments and tests that you can do at home for fun and profit. We can all agree that the better our stereos sound, the more enjoyable they become. Learning how to get better sound from the equipment and recordings you own doesn’t cost a dime. It simply requires that you improve your critical listening skills. Those skills develop through practice, by challenging yourself to understand what is really on your records — to figure out, to the best of your ability, what is right and what is wrong on every record you own. Same with your stereo. You can’t fix a problem that you haven’t yet recognized is a problem, right? Posted in Advice - Louder Is Better, Advice - What to Listen For in General, Advice – What to Listen For - Polarity and tagged audiophile vinyl, Better Records, hot stamper vinyl, Hot Stampers, hot stampers vinyl, tom port on March 30, 2017 by humorem. This is one of the pressings we’ve discovered with Reversed Polarity on some songs. The domestic copies of On The Border have many tracks in reversed absolute phase, including and especially Midnight Flyer, a lifelong favorite of mine. The front and center banjo will positively tear your head off; it’s bright, sour, shrill, aggressive and full of distortion. Don’t look at me — that’s what reverse phase sounds like! I’ve known for some time that domestic pressings of On The Border have their phase reversed — just hadn’t gotten around to discussing the issue because I wasn’t ready to list the record and describe the phenomenon. A while back [January 2005, time flies] I happened to play a copy of One Of These Nights and was appalled by the dismal quality of the sound. Last night I put two and two together. I pulled out both Eagles records and listened to them with the phase reversed. Voila! (On The Border is a favorite record of mine, dismissed by everyone else, but loved by yours truly. )I’m of the opinion that a very small percentage of records have their absolute phase reversed. Once you’ve learned to recognize the kind of distortion reversed absolute phase causes, you will hear recordings that may make you suspicious, and the only way to know for sure is to switch the positive and negative, wherever you choose to do so. Some of that story is also told in the link entitled Thoughts On Absolute Polarity. For their debut the Eagles recorded what we consider to be one of the Five Best Sounding Rock Records in the history of the art form. Of course the Eagles didn’t record anything, Glyn Johns did, and he deserves all the credit for turning that first album into a Demo Disc of the highest order. Halfway through this album, their third, they fired him. (The British ran Winston Churchill out of office after the war, so go figure.) Johns is credited with only two tracks on the album, and of course those two are the real Demo Disc tracks here. But as I way playing various copies of these original British SYL pressings (the SYL of Desperado is the one on the TAS List, don’t you know), I could easily recognize the fully-extended, harmonically-rich, super-low distortion, Tubey Magical, Unbelievably Sweet Glyn Johns Sound everywhere in the soundfield I looked. Every track has some of it. Maybe not the full measure you hear on You Never Cry Like a Lover, the standout track from side one, but enough to make you realize that even half of a Glyn Johns recording is head and shoulders better than what was to follow. One of These Nights, recorded by Bill Szymczyk, his replacement, is a step down in quality — if that step is off the edge of cliff. Say what you want about Hotel California — an FM radio staple that wore out its welcome decades ago, but not a bad recording by any means — it can’t begin to compete sonically with the likes of the first three Eagles albums that Johns did. 3) I must think I will want to listen to the music on the album fairly often and well into the future (not knowing how long I may be stranded there). How many records meet the Desert Island Disc criteria? Certainly many more than you can see when you click on the link, but new titles are constantly being added, time permitting. Here are some Hot Stamper pressings of Desert Island Discs you can actually buy. Posted in *Our Record Overview - The Good, Advice – What to Listen For - Polarity, Labels We Love - Asylum, Top Artists - The Eagles, Top Engineers - Bill Szymczyk, Top Engineers - Glyn Johns on October 1, 2016 by humorem.